In this instance, the product is a small bottle of cream containing Amonium/Sodium Bifluorides used to etch glass. Sure this matte finish on glass could also be achieved in a tumbler with some sand from the beach, but today I was going for more instant gratification. I never really thought about etch cream until I took a lampworking class with my friend Holly at the end of February in Rockland. Some of our more creative attempts at making glass beads produced colors we didn’t really like. Virginia Slawson, of Playing with Fire, said, “You know, those could have a whole different look if you etched them.” We discussed different ways to etch glass and the last time I was at A.C. Moore in Bangor I picked up a little bottle of fatal etch cream. 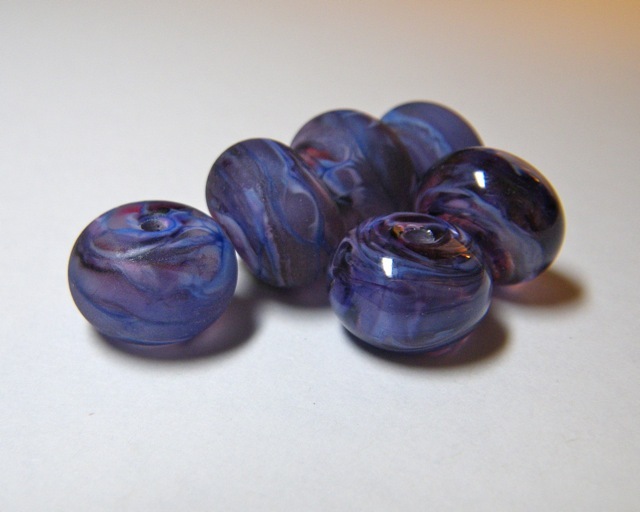 I am not set up to make my own glass beads (yet), so I love to buy them. 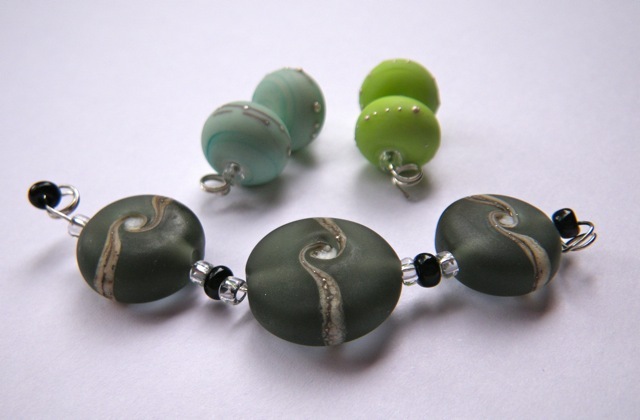 One of my favorite glass bead artists is Sue Kennedy of SueBeads. I’m always checking her blog to see what she has added recently to her Etsy site. The beads I am most drawn to are the ones with a matte finish; the ones she has etched. Below a pair of Sue’s etched glass beads with a pair of copper beads I made last week. 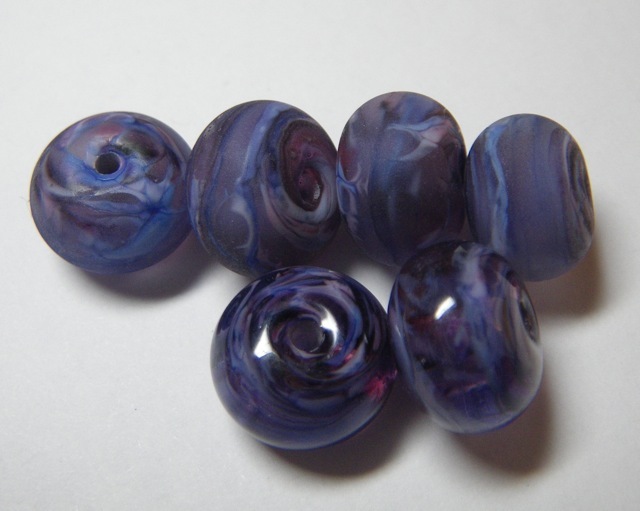 I also bought some shiny glass beads in shades of purple. I especially love how the light comes through the beads in front. I bought these beads specifically to try etching myself. I’m sure Sue would have done it for me if I had asked her when I ordered them. I had a hunch that I would really like how the lines and colors showed up if I etched them. et voila! I left two of the six beads un-etched for comparison. Also, if I ruined the ones I altered, I would at least still have 2 that I liked. The cream took longer to work than I thought it would, and it still makes me a little nervous to use it, but I’m happy with the results. You have such a good eye–those beads looked so pretty before the etch cream, then came out even prettier. Glad you survived the fatal part! Hi Barb! Thanks for featuring my beads! I use Dip N Etch, it’s liquid instead of cream, it works much faster! And yes, I would have etched them for you, but I’m glad you tried it! I love the look of etched beads. Can I put some of your photos on my blog? You can use any of my photos of your beads any time. Thanks for the tip about Dip N Etch. 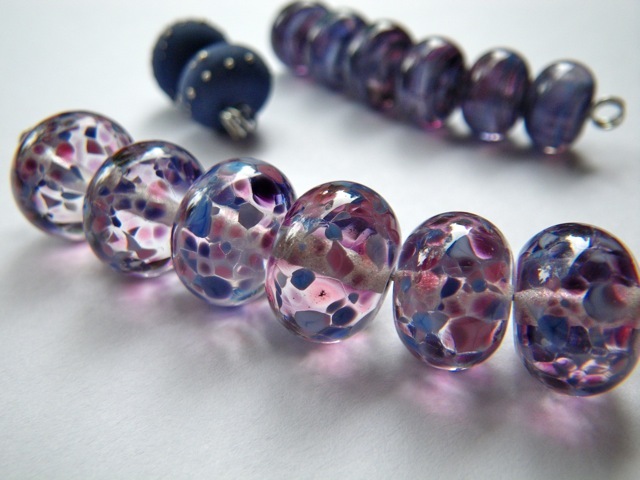 I love the look of etched beads too. I think most of the beads I get from you are etched. Some day, I hope to be etching some of my own beads. Though I can’t imagine getting time to try lampworking again until next winter. I can see why you love it so much! doesn’t it just make you want to etch everything, a bit?! i started thinking about stripes on the windows, even goofy stuff like stars or dots!!!! Yes it does! Sue Kennedy says she uses something called, Dip n Etch. (I think that was the name). It’s a liquid and it works faster than the cream. Are your beads for sale? I don’t have beads for sale…yet..but am thinking pretty seriously about it. 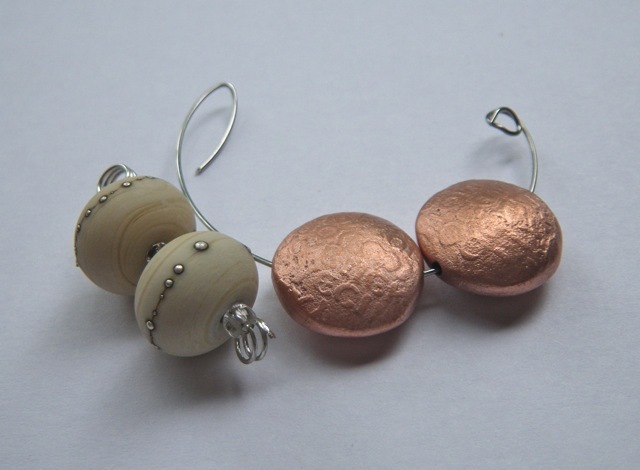 I don’t make any of the glass beads, but I do make the fine silver PMC beads.mAnd the copper and bronze beads. If you’re looking for the glass beads, those are made by Sue Kennedy. She has plenty on her Etsy site and they are all on sale until Dec. 30. Read the description at the top of the page for the coupon code.